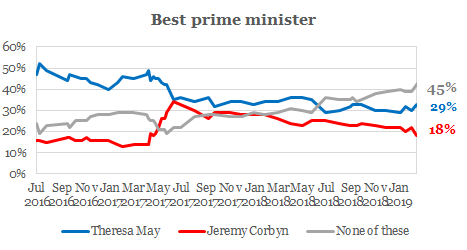 The Conservatives have maintained their lead in the polls, this week currently sitting at 4-points, while Labour, on 34%, sits at their joint lowest score since the 2017 general election. This week we have also seen both Theresa May and Jeremy Corbyn’s leadership standing suffer. Currently over two in five (45%) UK adults believe that neither party leader would make the best prime minister. To some extent, Theresa May has received some sympathy from the public for her position. Almost half (49%) now think the prime minister is brave, while 50% think she sticks to her principles. On the other hand Jeremy Corbyn has no such comfort. Only a fifth (19%) think he is decisive while only 19% think he is able to get things done.